Every person on Earth has 24 hours to make something happen each and every day. If you feel you lack enough of something, you have the same amount of time to get it as everyone else. Being poor doesn’t harm you. Being rich doesn’t help you. The 24 hours remains the same. 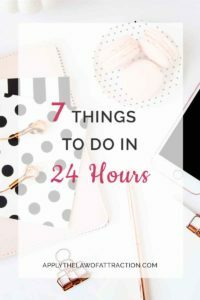 But, what will you do in your 24 hours? 1. Get more money. Every coin you find on the ground is money the Universe brought to you. Look for those coins. Pick up every one you see and put it in your pocket. You now have more money. Look for money in places where people easily drop money, such as around ticket or food vending machines. It takes seconds to bend down and pick up a coin. Start bending. You might surprise yourself and find a wad of money. It happened to a friend of mine. She found $80 in a parking lot! 2. Give yourself time to rest and relax. Hurried people seldom get what they want because they don’t take the time to ask for it or take the time to receive it. What does 15 minutes of the 24 hours mean? We sometimes stand in a line for 15 minutes. If every time you stood in a line, you relaxed and breathed deeply, you could clear your mind of negative thoughts, ask for what you want, and even use those 15 minutes to receive something from the Universe. 3. Believe that you’ll get what you want. Whenever negative thoughts creep into your mind about not getting what you want, you’re wasting your 24 hours. Why worry about something that hasn’t happened? If you keep worrying about, you might accidentally create the bad thing happen because the Universe only hears what you don’t want. It takes more seconds to say, “I’m never going to get what I want,” than it does to say, “I have it.” How many seconds do you want to spend on not getting what you want? 4. Stop multitasking. Focus on what you want and only what you want. When you fill up time with trying to juggle many things at once like tying your child’s shoelace while pushing a shopping cart while trying to remember to be thankful and ask that the tomatoes taste just like they came from your garden, something won’t get done. You’ve cluttered your mind and your wish list to the Universe. What was the most important thing to do? Ask for those juicy tomatoes. If your child was sitting in the cart, they couldn’t trip on a shoelace. Stop pushing and start asking. Be thankful after you get those juicy tomatoes. Minutes of focus on key things makes you more productive and sets you up for receiving even more from the Universe. 5. Live when you’re not working. If you typically spend 8 hours of your 24-hour day working for someone else, you still have 16 hours for you. What a great deal! How will you fill those 16 hours? The first hour may be how you spend your lunchtime. Do you work through your lunch? If so, now you're working for someone else for 8.5 or 9 hours a day? You’ve given away part of your life to someone else. Take it back!! Add it to your 16 hours for you. During your hours for living, you can make your dream board, write your “I have” list, repeat a mantra twice each hour, ask for help, or plan your vacation or how your new house will look. The opportunities await you when you decide that you have many hours to ask the Universe to make your life even better. What if you never had to work for anyone ever again? 6. Find people just like you. Stop hanging out with people who drag you down and waste minutes that turn into hours. Surround yourself with people who think like you, act like you, and have the energy to make it all happen. Their attitude feeds yours. Their high vibration raises yours. Don’t know where to find like-minded people? Just begin by talking to someone at a coffee shop or to a librarian. You never know who you might meet in 30 minutes and how your life may change. 7. Respect yourself. Last, but not least, be kind to yourself. Take a few minutes of your 24 hours to thank yourself for all you accomplished during those many minutes and hours. You did well. You made people laugh. You surprised someone. You made a new friend. You asked for something you wanted. You received many gifts from the Universe throughout the day. Wow! See what 24 hours can bring you?